Everyone Has a Story is about the quest of Meera to find an interesting story which she could weave into her book that she wants to pen down. 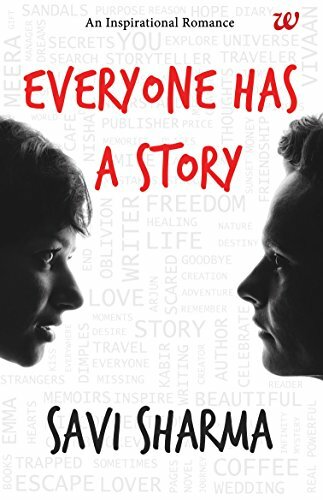 Savi Sharma has written Everyone has a Story as her debut novel. Apart from Meera, there’s Kabir who works at a cafe. Meera meets Vivaan one evening at the same Cafe. Vivaan is a banker who has dream to go around the world and explore everything possible. After meeting Vivaan, it took no time for Meera to realise what would be the story of her book. There is one more female character named Nisha. Savi Sharma was born in Surat, Gujarat in 1993. She was studying to be a Chartered Accountant but left studies to become a Storyteller. In 2016, She self-published her inspirational novel, Everyone has a Story which made her India’s first successful female self-published author. Later, she signed with Westland Ltd to write more stories. She is also co-founder of motivational media blog ‘Life & People’ where she writes about positivity, meditation, law of attraction, spirituality and other such topics. She loves observing people and often finds her stories while observing people at cafes. Savi also has a secret list of 100 wishes which she wants to fulfill in this one lifetime.